The New York Times has posted California's distribution of delegates from the Super Tuesday primary. NBC's Keith Olbermann and Dan Abrams tonight said Obama has a total of 861 delegates while Hillary has 855. The New York Times says Hillary is ahead with 904 to Obama's 724. That's a big discrepancy between NBC and the Times. Several of the states Obama won haven't yet awarded delegates according to the Times which may account for Obama's low total number. But, Hillary still has more from the Times than from NBC. Anyone know why? Many news organizations include delegate projections in their counts that are based on nonbinding votes for candidate preference, such as the Iowa caucuses. The New York Times counts only delegates that have been officially selected and are bound by their preferences. To make things even more confusing, here's the San Jose Mercury News saying Hillary has 1000 to Obama's 902. 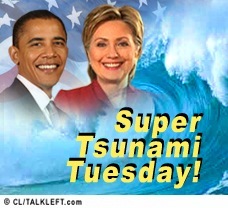 The New York Times analyzes Super Tuesday and concludes the "movement" and fervor that has become the hallmark of the Barack Obama presidential campaign fell short. Not that it petered out, just that as in New Hampshire, it failed to meet expectations. One telling sign: Last minute voters tended to go for Hillary. Throughout a week when Mr. Obama was campaigning with members of the Kennedy family, when there was a sense that he was creating a movement that cut across racial and generational lines, there was a steady movement of Democrats toward Mr. Obama, the survey suggested. But those who reported making their decision on the last day bucked the trend, tending to vote for Mrs. Clinton, of New York. Election results are so close in New Mexico that tomorrow morning, officials will begin hand-counting 17,000 provisional ballots. Provisional ballots are given to voters who show up to the wrong site, whose names are not on registered voter lists provided by the state or who requested an absentee ballot but signed an affidavit saying they did not return it. As of tonight, with one precinct left, Hillary Clinton is leading Barack Obama by 1,000 votes. With 183 of 184 of precincts reporting, Hillary Rodham Clinton held a lead of 1,092 votes — 67,921 votes compared to 66,829 for Barack Obama, according to preliminary results posted on the state Democratic Party's Web site. Officials from both campaigns will be present for the count, but the news media is excluded. At stake for Hillary and Obama: dividing up New Mexico's 26 committed delegates. There are also 12 superdelegates who can vote how they want once they get to the convention in Denver. With the race this close, it looks like a split of 26 delegates, whoever wins. I guess the rest is about bragging rights. At a rally in Chicago, Obama delivered a swipe at Clinton, telling supporters the race was between him and a candidate who accepts money from "special interests in Washington." During her speech tonight to supporters in New York, Clinton struck a different tone, congratulating Obama on his victories. "I look forward to our campaigns and our debates about how to leave this country better for the next generation," she told supporters who cheered her. Bump and Update: CNN calls California for Hillary Clinton. This is huge. Update: Check out this California election result map and click on "by city." Obama won: San Louis Obispo, Chico and Eureka -- that's it. In 2004, the major recipient of donations in 2004 was G.W. Bush. San Luis Obispo leans Republican. The last Democrat to win there was Lyndon B. Johnson. Chico is in Butte County which supported GW Bush in 2000 and 2004. California Dreaming...The polls just closed in California. Now we see who won the big prize. Offcial election results available here. 6:20 pm: I'm at Morey Middle School in Denver. I got here early, around 5:50 pm. There were Obama signs everywhere and lots of Obama volunteers and I didn't see any for Hillary. At least 10 caucuses are meeting here. I got in line. Within 10 minutes, there was a huge line behind me. Almost everyone is an Obama supporter. USA Today/Gallup, CBS/New York Times and McClatchey/MSNBC have new polling results. The full CBS Democratic poll is here (pdf). Among voters in those states, she leads Obama, 49 percent to 31 percent, with 16 percent still undecided. Clinton also holds a big edge on the issue of most concern to Democratic voters: the economy. Nearly 60 percent say she would do a better job of managing the economy than Obama. However, more than two-thirds of Democratic voters see the policy differences between the two candidates as minor. All the early voting states are now behind us. 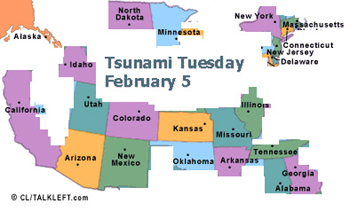 The big deal is Tsunami Tuesday, Feb. 5. Delegates will matter. This map shows the states holding Democratic caucuses and primaries. More than 1,500 delegates will be delivered from these states. 2,025 is the number needed to secure the nomination.